I grew up 40 minutes north of the 4th largest city in the United States. And it might as well have been 200 miles from the nearest civilization. Back then, it was the last-Dairy-Queen, barely-a-dot-on-the-map before you hit that stretch of 59 that turned into 2 parts speed trap, 1 part scary hillbilly cop movie, and 1 part I Know What You Did Last Summer. The grocery stores was tiny, the WalMart was even smaller, the town shut down on Friday afternoons during football season so everyone could stand in line at the concession stand under the bleachers for Frito Pie and a coke. And unless you were visiting from way out of town or just really lost, your favorite coke was Dr Pepper. My mom was a walking Barbara Mandrell song and always dropped a handful of peanuts in her Dr Pepper. That? I never understood. I mean, maybe. Sweet, salty. But the only thing I want to chew from my glass of Dr Pepper is ice. During the summer, mom would pack the ice cream maker in the sink with ice and rock salt, and then after what seemed like hours of rahnr-rahnr-rahnr, it was time for the greatest summer treat next to salted watermelon. With 23 (!!!) 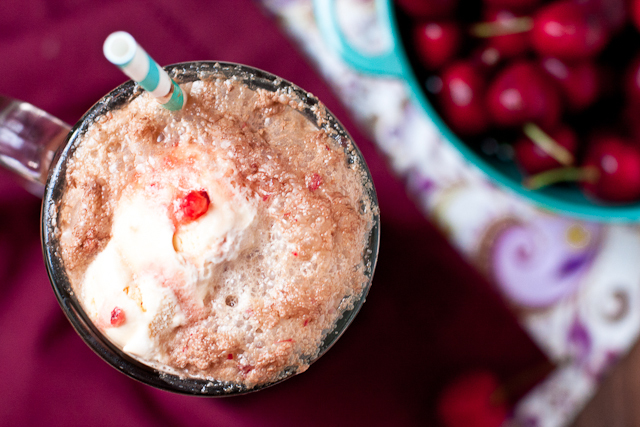 lbs of fresh cherries in the house, we took mom’s (peanut-less) Dr Pepper floats to the next, logical level: Cherry Dr Pepper Floats. 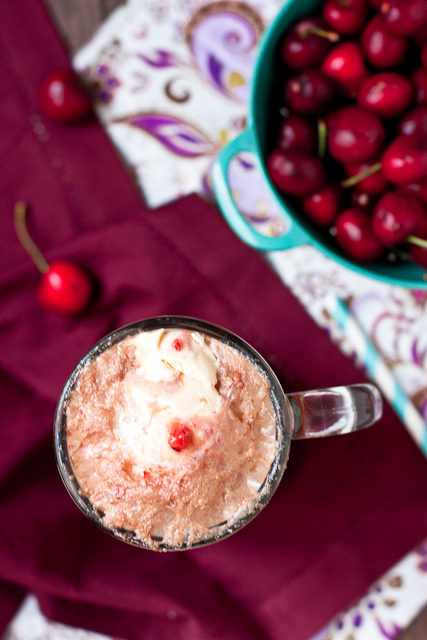 Muddled fresh cherries, a couple scoops of HEBs 1905 Vanilla Ice Cream (move over, Blue Bell Homemade Vanilla! ), and not-from-Dublin real-sugar Dr Pepper. Messy, fizzy, and creamy. And even better than I remember. What's better than a coke float? 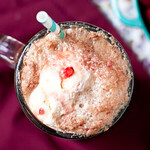 A coke float made with fresh cherries. And Dr Pepper. 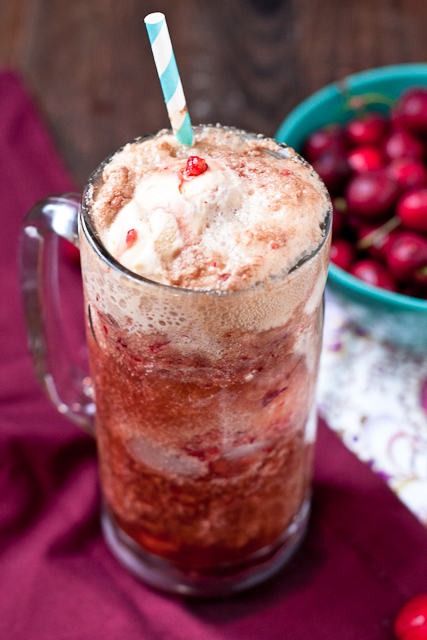 For each float, either muddle the cherries in the bottom of a frosty mug or pulse a few times in a blender (I vote the latter, especially if you're making more than 1). Scoop in the vanilla ice cream and then slowly (SLOWLY) stream in the Dr Pepper until full. Grab a spoon and a straw and enjoy. This is so my life!! I could have written this post, except for the Dr. Pepper…. I am a Coca Cola girl all the way. But will definitely be trying this out. I was always laughed at because in Indiana where I grew up, it was “paahp” all the way, but I INSISTED on calling in soda. I guess I just have a rebellious streak 😉 Dr. Pepper is my favorite kind of “coke” though so I’m going to have to give this a try. I’m drooling already! It’s good to know that I’m a true Texan (even though I wasn’t born in the US) because I refer to all things fizzy as Coke and when I was growing up (until my early 20’s) Dr Pepper was a way of life. And life would be super cranky if we were out of ice cold DP. But I think I had to wayyyyy too much because now the thought of drinking it makes my tummy turn. I might have to try this for the hubby though!! I love this post, especially the talk about “coke”. And you know you are a true Texan when this all makes sense to you-even the HEB vs.Bluebell reference. My son asked me to make my husband’s Father’s Day a Dr. Pepper Day and so I did! So fun! For some strange reason, my childhood was glaringly devoid of floats of any kind! But given how much diet cherry vanilla dr. pepper I drank in college…pretty sure I’d love these.